I've become a huge fan of Savina polishes. Every time I got to Nordstrom Rack, I'm more impressed by the color selection Savina has to offer. I'd say with all the colors I see Nordstrom Rack offer probably 60%-70% are colors that are unique to me, or have certain twists to standard colors that make them different. This next purple is a new love of mine. Wisteria is a vibrant medium lavender with a silver/white glass fleck shimmer. No review needed! What a gorgeous shade. I had no idea this brand even existed, and clearly I've been missing out! This is really pretty! I've never heard of Savina before, but I haven't been to a Nordstrom's Rack in years...guess I'll have to make stop; I'm intrigued! Wow! Soo pretty! I love the shimmer in it. You wear this colors so well! i feel the same way = i don't always know what to write about the polish's / colours. this colour with the silver shimmer is beautiful. 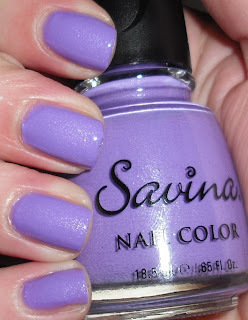 I'm loving dreamy purples this spring, this is a good one! So pretty! I wish these were available here..